The Nation: Free Speech With Purchase Of Democracy The Supreme Court ruled Monday, in a 5-4 decision, to stike down the Arizona law providing matching funds for publicly financed candidates running against well-financed opponents. John Nichols of The Nation sees this as another way of giving corporations the rights of its citizens. 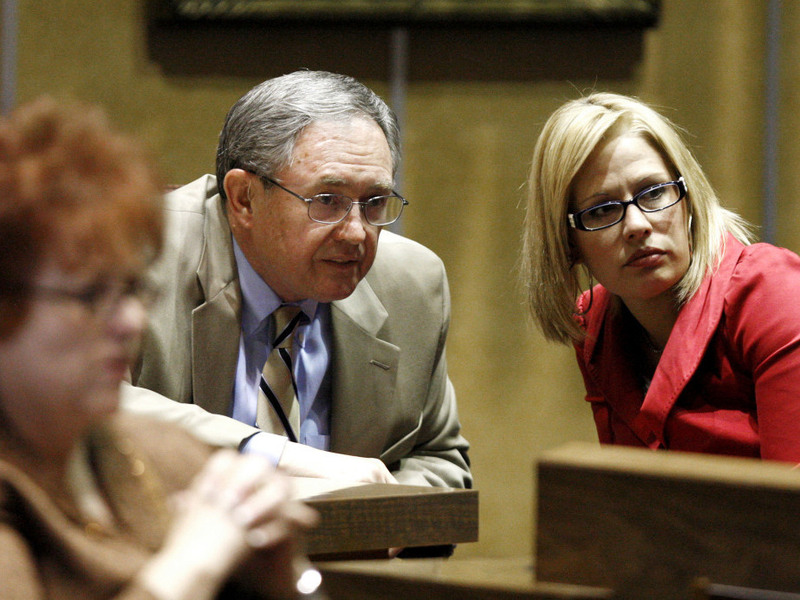 Arizona senators Republican John McComish and Democrat Kyrsten Sinema before the United States Supreme Court during a vote at the Arizona Capitol in Phoenix. The Supreme Court on Monday stuck down a provision of a campaign financing system in Arizona that gives extra money to publicly funded candidates who face privately funded rivals and independent groups. John Nichols, a pioneering political blogger, has written the Beat since 1999. The US Supreme Court's conservative majority continued its project of bartering off American democracy to the highest bidder with a decision Monday that will make it dramatically harder to counter free-spending attack campaigns funded by billionaire donors and corporate spin machines. With a 5-4 vote, the Court has struck down a matching-funds mechanism in Arizona's Clean Elections Law that allowed candidates who accepted public funding to match the spending of privately funded candidates and independent groups that might attack them. Under the Arizona law — which has long been considered a national model for using public funds to pay for campaigns — candidates who accept public funding are limited in what they can spend. Candidates who refuse public funding are not so constrained; and nor are independent groups that support privately funded candidates; indeed, in the aftermath of the Supreme Court's sweeping Citizens United v. FEC ruling of 2010, which cleared the way for corporations to spend as much as they like to influence election, restrictions to the flow of private money into politics have been all but eliminated. Faced with the threat of being overwhelmed by private money, no candidate would go the "Clean Elections" route, unless some mechanism was put in place to counter attack ads by privately funded opponents and groups associated with those opponents. The Arizona Clean Elections law provided that mechanism under a formula requiring that for every dollar a privately funded candidate (or group supporting that candidate) spent above established spending limits, a dollar in additional public funding would go to the "Clean Elections" candidate. The genius of the Arizona law was two-fold. The guarantee of matching funds assured that candidates who accepted "Clean Elections" money would be able to compete on a level playing field and, in so doing, this discouraged privately funded candidates and independent groups backing them from trying to buy elections with overwhelming spending. On Monday, however, the Supreme Court struck down the "matching funds" provision of Arizona's "Clean Elections" Act, declaring it to be an unconstitutional restriction on the free-speech rights of privately funded candidates and corporate-funded "independent" groups to shout down publicly funded candidates. In combination with the Citizens United ruling, Monday's ruling in the case of McComish v. Bennett creates a circumstance where corporations and their political allies will enjoy virtually unlimited political advantages over candidates who choose to run campaigns thaty rely on small individual donations or public financing. The court has removed one of the few remaining tools for maintaining a level playing field in politics, on which candidates of differing views might have won or lost elections based on their skills and ideas — as opposed to their relative financial advantages. In so doing, the Court has tipped the balance even further toward wealthy and corporation-allied candidates in a move that says the only speech right now protected in our politics is the right of those with the deepest pockets to shout down everyone else. "This decision, based on an upside-down interpretation of the First Amendment, takes away the right of Arizonans not only to ensure a modicum of integrity and fairness in their elections but to promote more political speech. The Court has thus ensured that the wealthiest can continue to pay for outsized political influence and maintain their speech advantages," says Marge Baker of People for the American Way. "The Roberts Court has once again twisted the Constitution to benefit the wealthy and powerful while leaving ordinary Americans with a diminished voice," added Baker. "Like in Citizens United v. FEC, which prohibited legislatures from limiting corporate spending to influence elections, the Court's majority has strayed from the text and history of the Constitution in order to prevent citizens from maintaining control over our democracy. The Roberts Court would do well to remember that the Constitution was written to protect democracy for all people, not just the rich and powerful. Today it has ruled not only that the wealthy have a right to spend more but that they have a right that everyone else spend less." Some reformers saw a measure of hope in the fact that the Court affirmed that public financing of campaigns in constitutional. For instance, Bert Brandenburg, executive director of Justice at Stake (the campaign to clean up state court elections) suggested that it might still be possible to write public financing laws that worked in some circumstances — particularly judicial contests. "Today's ruling is disappointing, but not fatal for America's courts. State judicial elections are drowning in special-interest spending," argued Brandenberg. "Properly crafted public financing laws are more critical than ever, so that judges do not have to dial for dollars from major donors who may appear before them in court." Ultimately, however, this latest ruling suggests that the Roberts Court is so determined to serve the interests of its corporate masters that it will not stop reimagining the Constitution until it serves only an elite. If that is the case, then only an amendment to the document will renew an honest intepretation of the free speech protections outlined by the founders. People for the American Way and other groups are pushing for an amendment. And several groups, including Free Speech for People and Move to Amend, have outlined strategies for doing so. After the court's Citizens United ruling came down, Move to Amend urged citizens to go to candidate forums and demand to know: "Do you support the opinion that corporations are persons and therefore have the rights of free speech under the First Amendment?" Now, after the Court's McComish ruling, citizens might ask: "And do you support the opinion that those corporations should always and in every instance be allowed to shout down citizens and candidates with whom they disagree?"